Our collection is mostly owned by railway volunteers who also perform all maintenance and restoration work on site using the railway’s facilities, with assistance from the permanent staff. If you visit us and can’t find the item you are looking for, please ask somebody. This is an operating railway and much of the rolling stock listed here is serviceable so things do get moved around on a fairly regular basis. 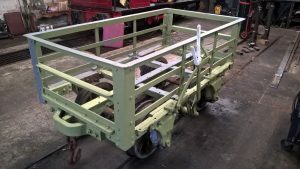 GWR 2 Ton slate waggon, under restoration in the engine shed.